John Ford said of this film, "WAGON MASTER came closest to what I hoped to achieve." A relaxed epic Western without major stars, it features Ward Bond as Jonathan Wiggs, a sardonic Mormon taking a wagon train of his people to Utah's San Juan Valley with freewheeling cowpokes Travis Blue (Ben Johnson) and Sandy Owens (Harry Carey Jr.) as guides. En route, the group comes upon a medicine show troupe, run by Dr. A. Locksley Hall (Alan Mowbray), that is heavily under the influence of its product and out of water, and they too become part of the caravan. As the trek continues, the Mormons also begins to run low on water, which is less of a problems than a meeting with the murderous Clegg family, led by the unctuous Uncle Shiloh (Charles Kemper), who claims that he and his five "boys" are simple cowhands. To avoid violence, Wiggs allows them to join the convoy but regrets it when the medicine troupe attempts to leave the wagon train and is stopped at gunpoint by the Cleggs. 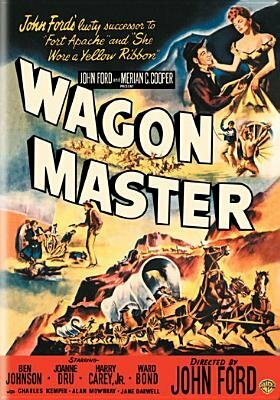 An enjoyable character-based excursion that draws humor from the uneasy coexistence of a wide range of social types, WAGON MASTER showcases the gruff and appealing Bond in a role that he would repeat, with little alteration (and great popular success), on television's WAGON TRAIN.